“Failed to open database. Your license key is already in use”. I cannot find my movie in your online database, now what? I added a movie using your online database, but some of the data is wrong? When I search By Title, I never get any results. Why? How do I transfer the program, my database and images to another computer? I do not see my data any more. I do not see my images anymore. Can I change the field value for multiple items in one go? How do I re-download the software for which I own a license? Can I use 1 license on more than one computer? How do I order as a gift? Do you charge extra for credit card orders? I am having problems ordering, please help? I purchased the wrong software. How can I get a refund? 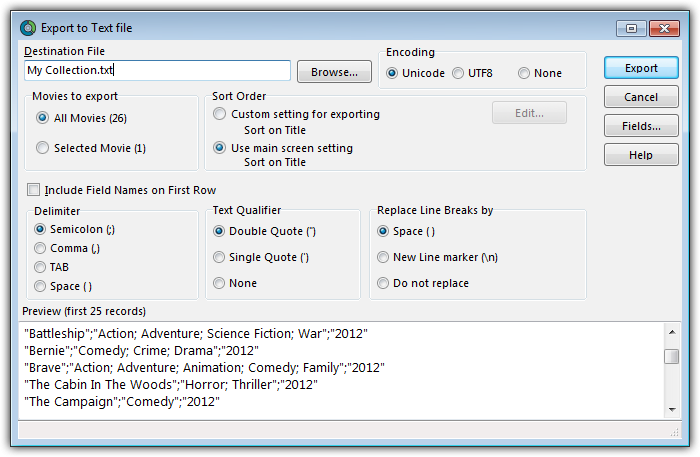 In the Export to Text screen, you can select the Sort Order (or use the Main Screen setting). You can also select the fields you want to export. Name your file and click the Export button. By default your file will be saved in the Collectorz.com/Movie Collector folder. *On macOS computers, the file will always save as a .txt file. You can change the extension of the file to .csv later if you’d like.